Good beekeepers are always thinking six months in advance. When we make our first brief hive inspection in late winter, we check to see if the bees survived the winter. At the same time, we are also checking to see if the colony has the potential to expand into a strong summer colony. If the bees didn’t survive the winter, we protect the combs so that we can fill the hive with a new colony in the spring. 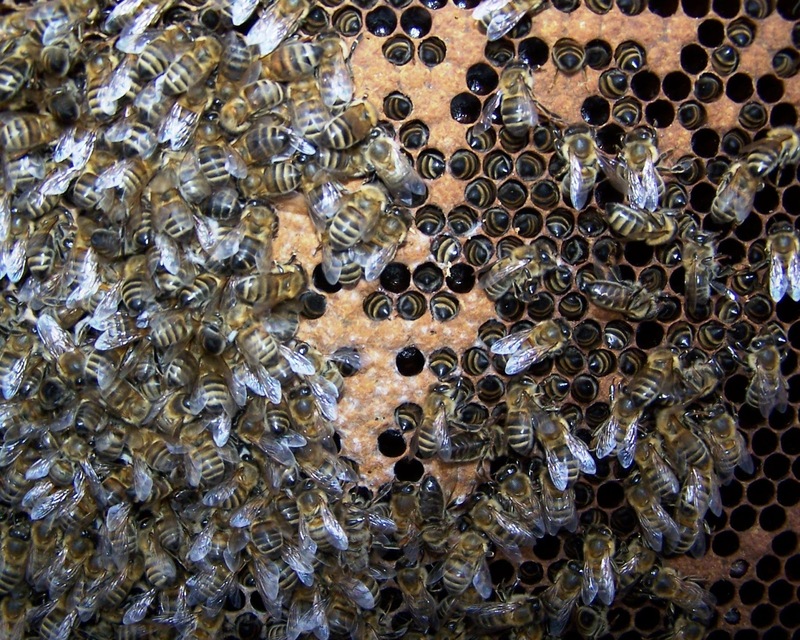 When we feed our bees pollen and sugar syrup in the spring, we stimulate the queen to lay eggs and produce a large population of bees to gather an abundance of summer honey or pollinate crops. In the spring, when we reverse our hive bodies and expand the brood nest by rearranging brood frames, not only are we providing space for our queens to lay eggs now, we are also reducing the bees’ desire to swarm later on. Our bees rely upon us to build their hives. We must plan ahead and build enough hive bodies to accommodate a large colony and enough supers to hold next summer’s honey. 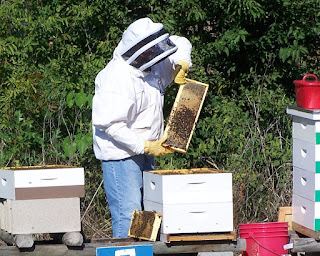 Effective beekeepers learn when major nectar flows occur so that they can place the supers on their hives in time to gather a surplus of honey. When we harvest and extract honey, we are also preparing the combs for next year’s honey crop. When we treat our hives for Varroa mites in the fall, we are killing mites at the time and ensuring that we will have a larger population of bees to maintain a warm cluster in the winter. When we provide supplemental feedings in the fall, we are encouraging our queens to extend their egg laying, ensuring that we will have plenty of longer-lived worker bees to produce the brood food for next year’s first brood. Likewise, when we set up our hives for winter, we are actually setting the conditions for finding a healthy colony in the spring. We are continuously reminded that the climate is in change. Measurements made by NASA and NOAA revealed that the earth warmed to record levels this past year (www.washingtonpost.com/news/energy-environment/wp/2016/01/20/its-official-2015-smashed-2014s-global-temperature-record-it-wasnt-even-close/?wpisrc=nl_rainbow). Following this warm year, our Mid-South winter has been so mild that it seems more like an extended fall season. While warm winter weather makes for comfortable days for humans, it potentially leads to starvation of honey bee colonies. Normally, in the winter honey bees remain clustered together for warmth inside their hive and only fly when the outside temperature rises above 50 degrees Fahrenheit. This year’s warm temperatures have been the trend through this mild winter. Flying bees search for flowers in bloom to forage for nectar and pollen. Unfortunately, few blooms are available at this time of the year. Flying expends more energy than the bees would require if they remained clustered inside their hives. The result is the bees consume their honey stores faster than in cooler winters. Several area beekeepers have already experienced losing colonies to starvation, which usually peaks in March in the Mid-South. It is a good idea for beekeepers to supply some emergency feeding of sugar to hives that are light in weight at this time. Today’s photo reveals a colony of bees that died of starvation. 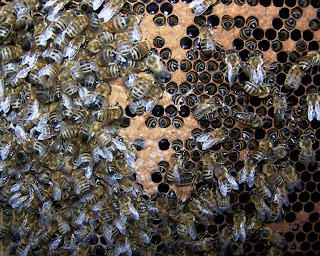 You can see that the queen has been laying eggs by the fact that the cluster of bees is gathered around capped cells of pupae. The bees must maintain a 95 degree temperature in the brood area. The bees consume plenty of honey to generate the heat to warm the brood. The fact that the colony died of starvation is readily revealed by the dead bees with their heads downward in the cells. Due to the honey bees’ food-sharing behavior, the entire colony dies at one time as the honey stores in the hive are depleted. Beekeepers need to watch their hives carefully for a few more weeks until flowers spring into bloom.